If you're craving a Cuban vacation but your wallet's screaming not today, Downtown's newest coffee shop is now open and serving a taste of the Caribbean—and it could be just the ticket to tide you (and your wallet) over. Brothers José María and Ramón Gaviña began the coffee business in 1870, planting beans by hand on their southern Cuba farm. 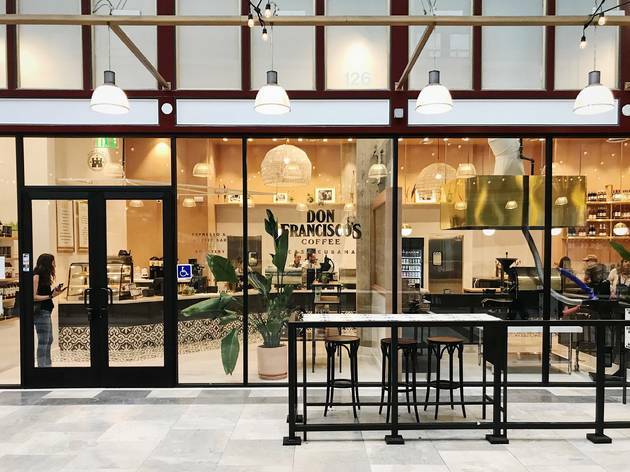 Now, nearly 150 years later, the Gaviña family is continuing the business out of a breezy and bright café in the Spring Arcade, between Broadway and Spring Street, which opened this morning. 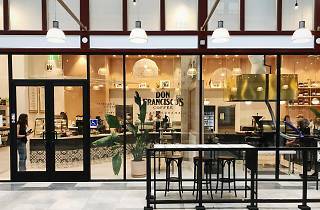 Don Francisco's Coffee Casa Cubana sits pretty inside the bulb-lit arcade at 541 South Spring Street, where it's serving Don Francisco's Coffee—the product and company founded by Don Francisco Gaviña, the son of Ramón—as well as beer, wine, Cuban pastries, sandwiches and espresso. It's the first brick-and-mortar location for Don Francisco's, and the culmination of a successful retail and wholesale operation that's been roasting beans in L.A. since 1967. Fans who've purchased the brand's bagged beans at Whole Foods, Target, Ralph's and other major outlets will be pleased to know they can also pick up beans in-store, in addition to drinks from a full menu entailing café con leche, Havana coconut lattes, cortaditos and more. Those feeling peckish can order house-made Cuban pastries such as papas rellenas, where ground beef picadillo fills fried mashed potato balls, or the pastelito de guayaba y queso, which stuffs guava marmalade and cream cheese into flaky pastry dough. There's all-day breakfast, featuring a pork and plantain hash sandwich (below), and a sandwich selection offering everything from shredded flank steak with manchego to a chorizo burger topped with crispy potatoes (and yes, the buns are made in-house, too). "We picked Downtown and this historic district because it's an exciting place with vibrancy, so it was natural for us," says co-owner Frank Aparicio. "It took awhile with planning and picking the right place, but Downtown just felt right." Casa Cubana is just one of Spring Arcade's attractions, with neighboring Blu Jam Café and Guisados, among others. Currently the Cuban café is open from 7am to 7pm daily, but eventually may serve as late as 10pm—a perfect destination for a late-night snack and a glass of wine on that too-cute indoor patio. Don Francisco's Coffee Casa Cubana is now open at 541 S Spring St serving coffee, pastries and more from 7am to 7pm.